Signature Story Men (Eau de Toilette) is a perfume by David Beckham for men and was released in 2009. The scent is sweet-floral. It was last marketed by Coty. When I went to visit my boyfriend recently, one of the first things I noticed on his bedside table was a new bottle of Signature Story for Him. 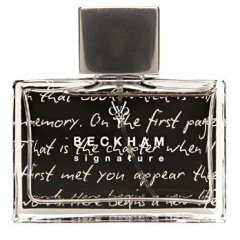 His regular gym scent used to be Signature for Him and once that was gone, (since I expressed my dislike of it), I assumed that there would be no more Beckham fragrances in his collection. I was not familiar with this fragrance, and in some ways I was intrigued. Now since testing it, I can sort of see why he bought it as a replacement for the original Signature for Him. Signature Story for Him is a pleasantly masculine and fresh scent, which is thankfully rather soft in terms of sillage. It's not complex, however it smells interesting with sour pineapple complimenting earthy and herbaceous notes like lavender and patchouli. Lavender smells fabulous on my boyfriend's skin, so this fragrance works wonders. He's a relatively buff kind of a guy, so having a gym scent that can withstand strenuous workouts while keeping him smelling 'fresh' is a must. I like this fragrance for that reason, but I must admit that I suggest he wears other fragrances if we are planning to cuddle at home or go out to dinner. Supposedly there's incense in this composition. I don't smell it, but I do detect a good dose of patchouli, lavender and rosemary. The scent pyramid may look unique, but trust me, this is a very likable and universally pleasing scent. I wouldn't go so far to say generic, but it does fit into that 'celebuscent' category. Due to Signature Story for Him's freshness, I would recommend this fragrance for both Autumn and Spring. It's a nice 'pick me up' in the morning, and wears well casually, however it's nothing that spectacular. It's still quite expensive in stores, but can be found online rather cheaply. I personally still prefer Intense Instinct and Intimately Beckham for Men, however I am willing to accept this new addition to my boyfriend's perfume collection, and in time I hope to become accustomed to it. Write the first Review for Signature Story Men (Eau de Toilette)!